Bilal Travels has officially launched the e-ticket service for its customers. 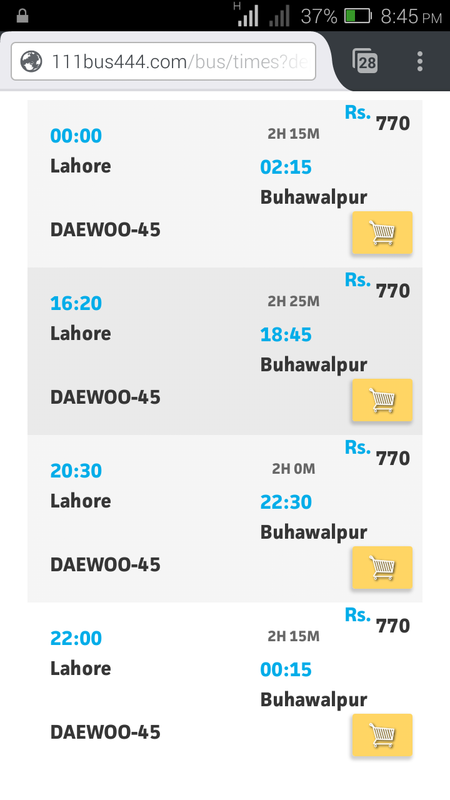 For people who have traveled via these domestic bus services know the struggle one has to face while making a reservation for the seats. Often times your call won’t be picked up timely, leaving you fuming and opting for a different travel agency. Some people may even have experienced their reserved seat being allocated to a different person as well. All these problems boil down to the fact that there exists an inefficient booking method. The manual booking system does not belong in the 21st century which is why Bilal Travels has taken the initiative to change things. “We are super excited today on the launch of our online ticketing across Pakistan in collaboration with Bookme.pk. We believe that this will further strengthen Bilal Travels brand name as a leading bus company. Our customers can now book tickets with seat selection and can pay via number of ways. Bookme.pk’s role here is commendable as they are handling all our online presence. We are looking forward to open several new features and options to our customers very soon with bookme. The online ticketing is powered by Bookme.pk. The e-ticket can be obtained by visiting Bilal Travels website. Here’s a small guide on how to book your ticket online. The main page of the website is simple and very user-friendly. The clean look makes navigating the site easier. In terms of usage, customer has to enter his or her current city, destination, date they want to travel on and they are good to go. After searching for your desired destination on a specific day, the website will shortlist all the possible buses. The departure time is mention in front of the respective bus along with the charges. Whichever option suits the customer the most, they can book that trip by clicking on book button. After the bus has been identified by the customer, they now need to select their seat. The male and female seats are divided into pink and blue color coding scheme whereas grey implies that the seat has already been taken. Customers can click on any seat they would like to be seated on and press continue. The last step is to finalize the payment method. On the left side, all the information will be summarized which the customer just confirmed. The right side of the panel, you can see Your Information category which lists personal information such as name, number, CNIC number and credit card information. The payment can also be made via mobile account or at any Easy Paisa shop nearby. The initiative is quite interesting as it has a lot of potential. However, it remains to be seen whether the website and the database of their website can withhold traffic in the busy days such as summer vacations or public holidays. The only drawback we can conclude is the lack of awareness in people to access Internet and do the booking themselves as majority of the aged people in Pakistan have trouble with technology. Note: The Handling Charges are 5% of the actual ticket price. Oh yeah! Why would ProPakistani mention this for a paid post. what is this handing charges??? unable to book any of the first 10 seat numbers. what is this policy? Was always a crap applicaiton I have deleted it many times and today after this post I have added it again but same error, no timings are available and then there are 3 Bilal Travel, who knows which one is we are going and where they stands off. Bilal daewoo has made alot of progress. Rs.746.0 against your Order ID BT00171103 before the expiry date/time. at the Easypaisa outlet to receive confirmation of your payment. You will receive a confirmation SMS from 3737 as an electronic receipt. Thank You for using Bookme. Guys.. Don’t use Bilal Travel, even in your dream.. I used it from Mansehra, they gave me ticket of bilal travel but the bus I was traveling not Bilal Travel, it was only using Bilal Travel terminal. Driver , Conductor was very unprofessional and even abusing. They used GT road and selected Motorway from Islamabad. It was around 5 hours (give or take) which was covered in 7.30 hours. Bilal Travel is phathatic and ****.. Appology in advance but don’t use Bilal travel..
Free Wifi,OBES System(Movies,Songs etc) are perfect for the journey. They will never let you get seat in first row even if it is available, And their staff i will only say one word about their staff RUDE! karachi sy nhi chalti kia??? Assalam o Alaikum. Sir ! how can i came to know that my seat is confirmed???? I buy a seat(# 14) from Lahore to Joharabad. the confirmation message i not received. please guide.